The Inquiry into Disciplinary Literacy and Learning network kicked-off the year by meeting at Saline High School. Through a tour of the school, including the culinary arts and automotive technology programs of the South and West Washtenaw Consortium, our group saw examples of disciplinary literacy in action. Shelly Venema, IDLL member and Saline HS teacher, also presented on the district wide literacy goal of speaking and listening. 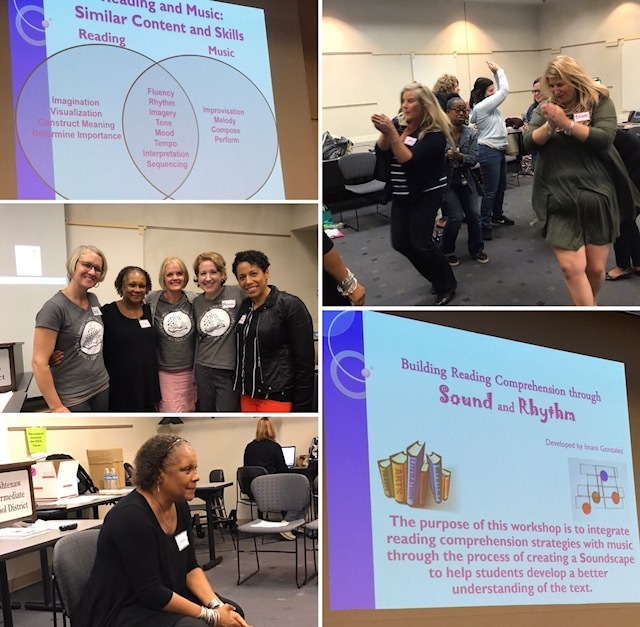 Musical artist, educator and professional vocalist Imani Gonzalez visited the Study of Early Literacy network on October 3rd to present Building Reading Comprehension Through Sound and Rhythm. Ms. Gonzalez taught SOEL teachers the Soundscape process- using sound and rhythm to explore ways to develop reading comprehension strategies and make connections between music and language. This learning process will help students attend to sensory images, use questioning strategies, respond to inference, and determine importance, helping students develop a better understanding of the text. Through Soundscapes, children will develop listening skills through collaboration, build interpretation and oral presentation skills through communication, and improve reading fluency through creativity.